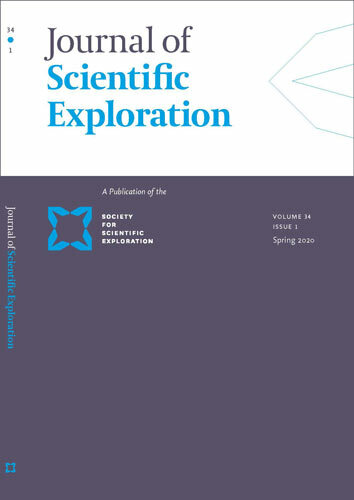 The Journal of Scientific Exploration publishes material consistent with the Society’s mission: to provide a professional forum for critical discussion of topics that are for various reasons ignored or studied inadequately within mainstream science, and to promote improved understanding of social and intellectual factors that limit the scope of scientific inquiry. Topics of interest cover a wide spectrum, ranging from apparent anomalies in well-established disciplines to paradoxical phenomena that seem to belong to no established discipline, as well as philosophical issues about the connections among disciplines. The Journal publishes research articles, review articles, essays, commentaries, guest editorials, historical perspectives, obituaries, book reviews, and letters or commentaries pertaining to previously published material. Read the author guidelines below. Click on the Submit a Manuscript Now button below. Follow the steps to submit your manuscript. Need help? Contact Kathleen Erickson. The SSE uses Open Journal Systems on a separate website to process submissions (see above). Authors must log in or register for a free account on that website in order to submit a manuscript. Manuscripts should be in the Microsoft Word, OpenOffice, RTF, WordPerfect, or LaTex document file format. Microsoft DOC or DOCX is preferred. Manuscripts should be double-spaced, and any tables and figure captions should follow the Reference section. Do not embed tables or figures in the text. If there is more than one table, each table should be on a separate page. Figures should be saved in separate files from the text (i.e., if there are three figures, there should be three figure files). Figure captions should be placed in the manuscript file, at the end. Do not include the captions with the figure files themselves. Note: Before submitting a manuscript, become familiar with Journal style by reading articles from past issues in our Library. Manuscripts will be sent to one or more referees at the discretion of the Editor-in-Chief. Reviewers are given the option of providing an anonymous report or a signed report. In established disciplines, concordance with accepted disciplinary paradigms is the chief guide in evaluating material for scholarly publication. On many of the matters of interest to the Society for Scientific Exploration, however, consensus does not prevail. Therefore the Journal of Scientific Exploration necessarily publishes claimed observations and proffered explanations that will seem more speculative or less plausible than those appearing in some mainstream disciplinary journals. Nevertheless, those observations and explanations must conform to rigorous standards of observational techniques and logical argument. If publication is deemed warranted but there remain points of disagreement between authors and referee(s), the reviewer(s) may be given the option of having their opinion(s) published along with the article, subject to the Editor-in-Chief’s judgment as to length, wording, and the like. The publication of such critical reviews is intended to encourage debate and discussion of controversial issues, since such debate and discussion offer the only path toward eventual resolution and consensus. Letters commenting on articles and essays will, before publication, be sent to the authors of those pieces with the invitation that they make a response in the same issue of the Journal. Where a lengthy discussion of an article or essay is warranted, it may be published as a Commentary, possibly together with a response by the author of the original piece. Letters to the Editor about book reviews and abstracts of Articles of Interest should focus strictly on inaccuracies and errors committed by the reviewer or abstracter; they should not argue with the substance of the reviewed book or abstracted article. Reviews and Articles of Interest abstracts serve readers by bringing to their attention material likely to be of interest. Book reviewers and abstracters of Articles of Interest aim to present useful descriptions of the content of the material, but cannot be held responsible for factual errors or for controversial opinions in that material. Reviewers and abstracters are also entitled to comment, within reason, on what they perceive to be errors or inadequacies or unjustified interpretations. It can be taken for granted that not everyone will agree with opinions expressed in the books or articles, or in reviews or abstracts of them; therefore Letters to the Editor should concern factual mistakes, not mere differences of opinion. Manuscripts should be prepared using past issues as a guide. The Reference section must be double-spaced, and all works cited in the text, appendices, figures, tables, and notes must be listed under References. Avoid abbreviations of journal titles and incomplete information, and give publisher or accessibility information (such as a url). References should refer only to material cited within the text and should be placed at the end of the manuscript. Non-retrievable material, such as papers presented at meetings, reports of limited circulation, unpublished works, unrefereed sources such as newspapers or magazines, and personal communications, should be restricted to works absolutely essential to the article. Citations appear within the text itself in the Author (Year) format (e.g., “Smith (1970) compared reactions.” or “Reactions were compared (Smith 1970).”). Tables should be included on separate pages. Number each table and include a brief caption that explains the content. Tables should be in Excel or Word format. All figures, including photographs, must be submitted as electronic files, preferably as TIFFs. For photographs, authors must scan the photograph to create an electronic file. Figures should have a minimum resolution of 300 dpi when sized for the publication (please see a recent issue for Journal size). Figures must be submitted in separate files (i.e., if there are three figures, there must be three figure files). Figures submitted in any non-graphic format (e.g., Microsoft Word, Microsoft PowerPoint) may not be of sufficient quality for publication in print. Direct questions about figures to the Managing Editor. A copyedited manuscript will be sent to the corresponding author, and may include queries from the copyeditor or Managing Editor. The corresponding author should return the copyedited manuscript with changes, corrections, and answers to queries within one week. One set of page proofs will be sent to the corresponding author for review. These should be carefully proofread. Except for typographical errors, corrections should be minimal, and rewriting of text is not permitted. Return page proofs to the Managing Editor within 48 hours of receipt. Each author will receive one copy of the published Journal with their contribution in it. Authors retain copyright to their writings. However, when an article has been submitted to the Journal of Scientific Exploration for consideration, the Journal holds first serial (periodical) publication rights. Additionally, the Society has the right to post the article on the Internet and to make it available via electronic as well as print subscription. The material must not appear anywhere else (including on an Internet website) until it has been published by the Journal (or rejected for publication). After publication in the Journal, authors may use the material as they wish but should make appropriate reference to the prior publication in the Journal; for example: “This paper (material) first appeared in the Journal of Scientific Exploration, vol... no... pp..., under the title ”xxxx’’, published by the Society for Scientific Exploration, www.scientificexploration.org)’’. While every effort is made by the Society and the Editorial Board to see that no inaccurate or misleading data, opinion, or statement appears in this Journal, they wish to point out that the data and opinions appearing in the articles and advertisements herein are the sole responsibility of the contributor or advertiser concerned. The Society’s officers, agents, Editors, and the Editorial Board accept no responsibility or liability for the consequences of any such inaccurate or misleading data, opinion, or statement. The names and email addresses entered in the journal submission and peer review site will be used exclusively for the stated purposes of this journal and will not be made available for any other purpose or to any other party. As part of the submission process, authors are required to check off their submission’s compliance with all of the following items, and submissions that do not meet basic criteria will not complete the online submission process (and move automatically to the Editors) until all items have been checked off by the author. The submission file is in Microsoft Word, OpenOffice, RTF, WordPerfect, or LaTex document file format. Manuscripts are double-spaced, and any tables and figure captions follow the References section. The text adheres to the stylistic guidelines of prior JSE issues. For general assistance in writing an academic article, please review Writing the Empirical Journal Article, by Daryl J. Bem, Cornell University.